(l to r): Bill, Anna, Nat, Phil, Charles, Steve, Jean, Declan, Mike. A couple of years ago at one of our Conventions, Franklin suggested a London Field Trip. Over the next two years it took shape, and it happened on 5th May. There is so much in London that is DW related that it is impractical to see everything in one go. 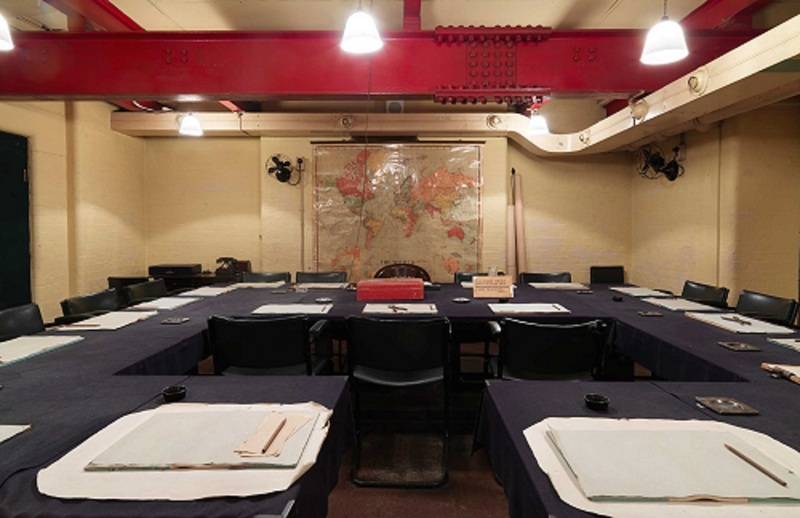 We therefore decided to concentrate on one facet of DW’s London life – his work as a Deception Planner in Churchill’s underground bunker in World War Two - though we added on a few other places that members of the group wanted to see. In the end there were nine in the group. The Gs had originally intended to make it, but in the end could not come, and nor could the tour's principal architect Franklin, who was overseas. They were missed, enormously, as were the other Conventioneers who could not attend. 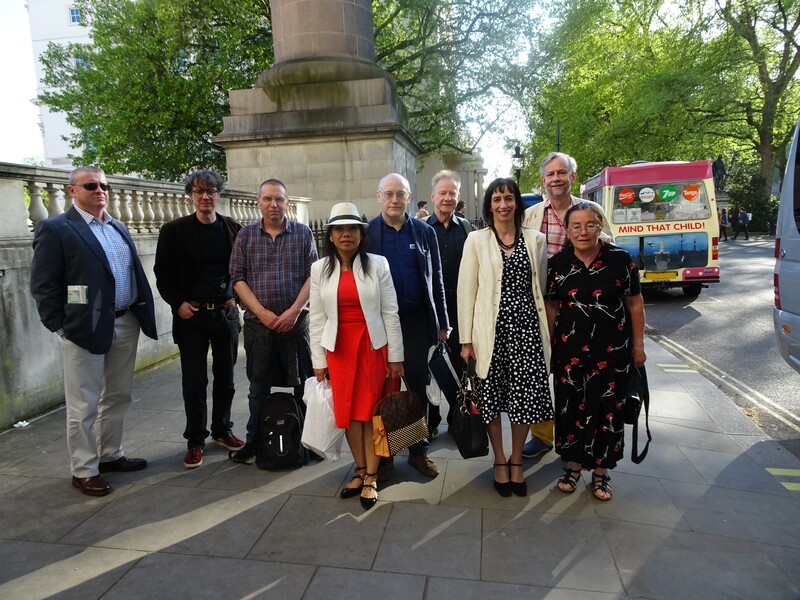 We gathered at Colbert's in Sloane Square for a coffee before setting off at 10 a.m. on the five minute walk to Cadogan Square. DW lived at Number 60 part-time from 1961 and full- time from 1969 until his death in 1977. In 1961 he bought the lease on the first floor flat from Lord Donegall’s second wife, and in 1968 he acquired the lease for the whole house from another tenant, on condition that the tenant could stay in the top floor. DW and Joan occupied the first and second floors, and put in a private lift between them. 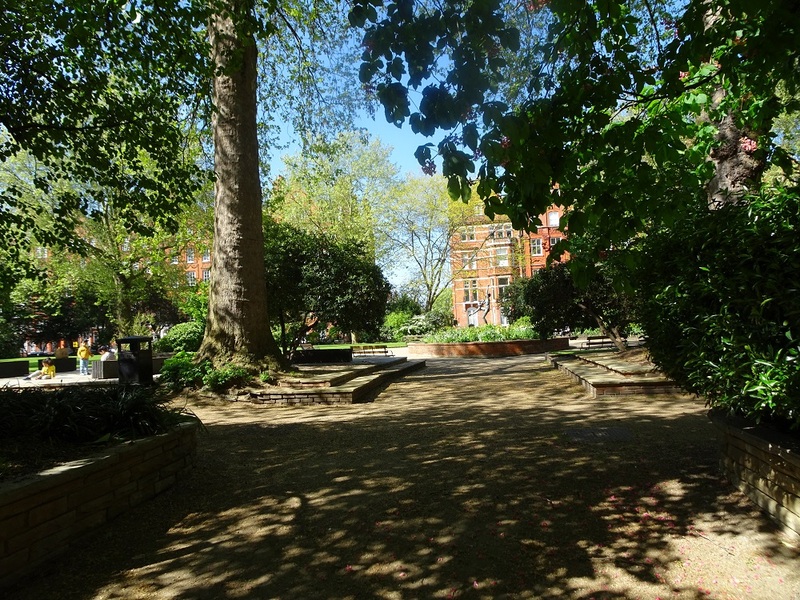 We admired the wonderful red brick, and the ambience of the Square, now (and probably then) one of the most expensive parts of Central London. A flat these days would cost you leasehold several million pounds, and a whole house maybe ten times that amount. 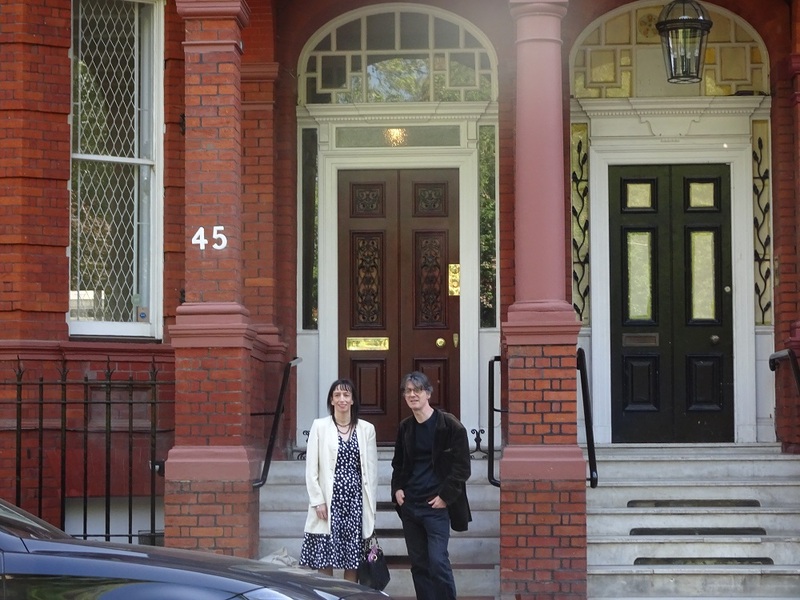 We also admired Sir Christopher Lee’s house, which was at Number 45; directly opposite DW’s across the Square. From Cadogan Square, we took a luxury minibus (and the word luxury was, as is so rarely the case, fully justified) up to Melina Place, NW8, which Phil Baker has identified as the real life inspiration for the place in which Simon Aron entertains the Satanists in the opening chapters of ‘The Devil Rides Out’. En route north, we witnessed, completely unplanned, a sight that would have stirred DW’s blood. 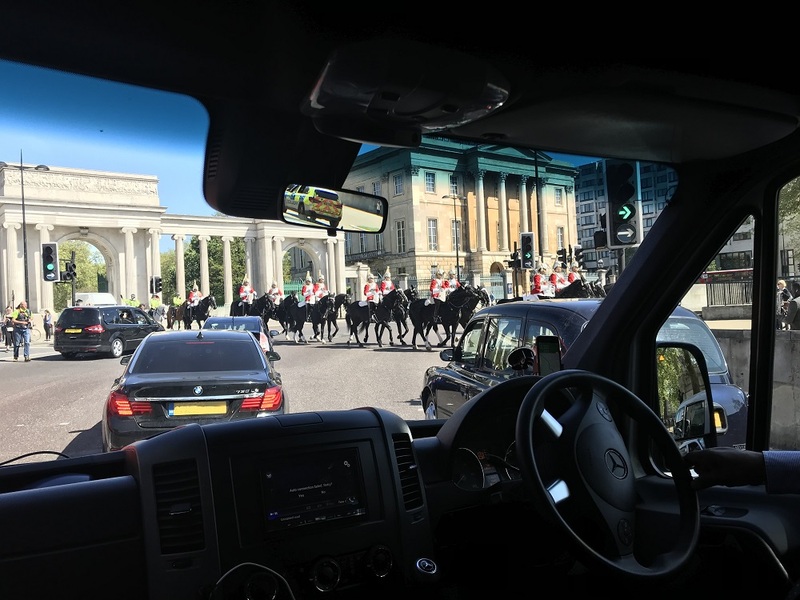 Traffic halted briefly as a detachment of the Household Cavalry rode past. They looked most impressive with their breastplates sparkling in the sunlight. Even in daylight, Melina Place looked a bit spooky to us, but I suppose that was our active imaginations. The relevant sections of ‘The Devil Rides Out’ were read out, and a local florist asked what we were doing. When Phil explained that some Satanists had gathered in the past at one of the houses, she seemed totally unconcerned – even before Phil went on to explain that it was in fiction rather than in fact. 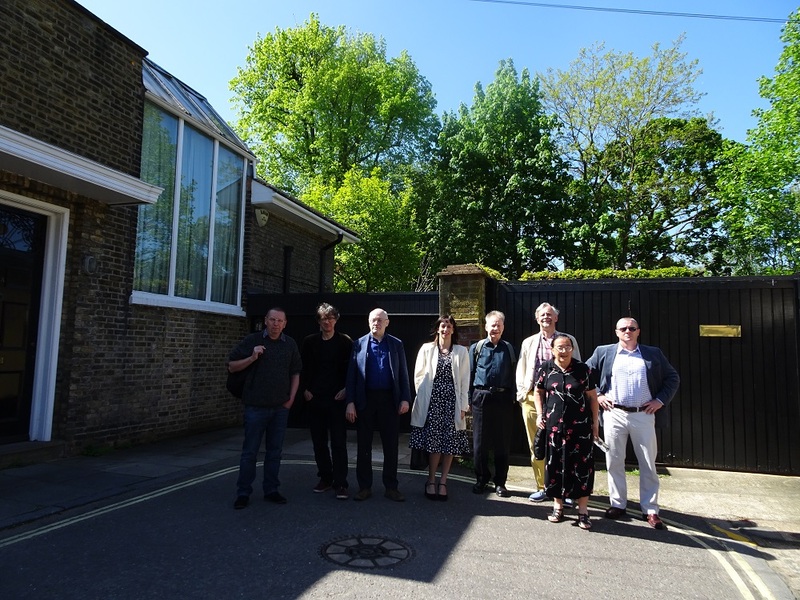 From Melina Place we took an impromptu detour to St Johns Wood Park, the road just five minutes away where DW and Joan lived from 1935 to 1940, when they were bombed out. It is just possible that DW came across Melina Place when he was house hunting (‘TDRO’ was published in December 1934), and before he bought Number 8. The whole street was bombed in December 1940 (an article was later written about it, with the title ‘The Street That Died’) and it has all been rebuilt. We looked at the current Number 8, which may well be on the same site. If it is, we were looking at where bestsellers from ‘They Found Atlantis’ and ‘Contraband’ to ‘The Black Baroness’ were penned (or should I say pencilled ? 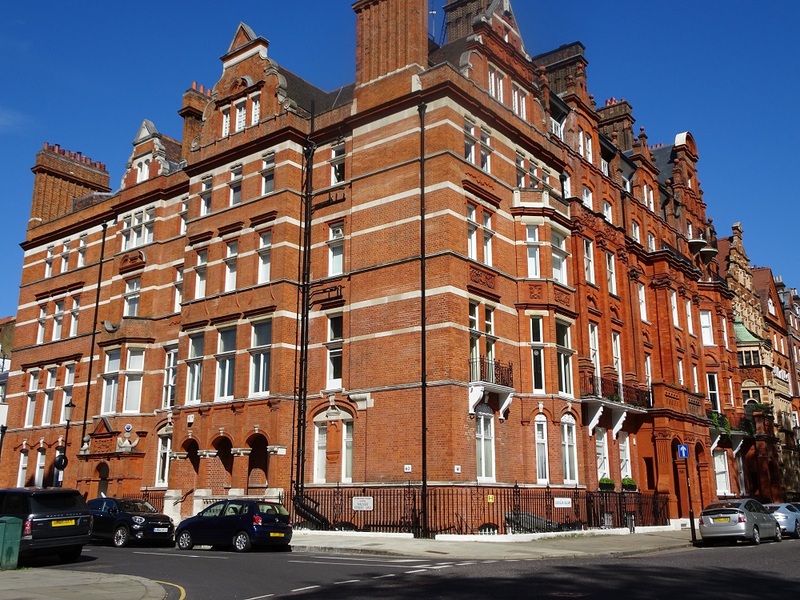 ), where the Crime Dossiers and two of the Board Games were thought-up, where DW listened to the radio on 3rd September 1939 to the news that war had once again broken out, and where DW wrote his first War Papers. A really productive period of DW’s life. The house had a fifty foot oak tree and big herbaceous borders, but of course none of these survive either. From St Johns Wood Park, we made our way southwards to Rules in Covent Garden, where we had our lunch. At Rules, which is London’s oldest restaurant (established in 1798), we had booked one of their exclusive private rooms, the John Betjeman Room, named after the Poet Laurate, who once helped campaign to prevent the restaurant’s destruction. 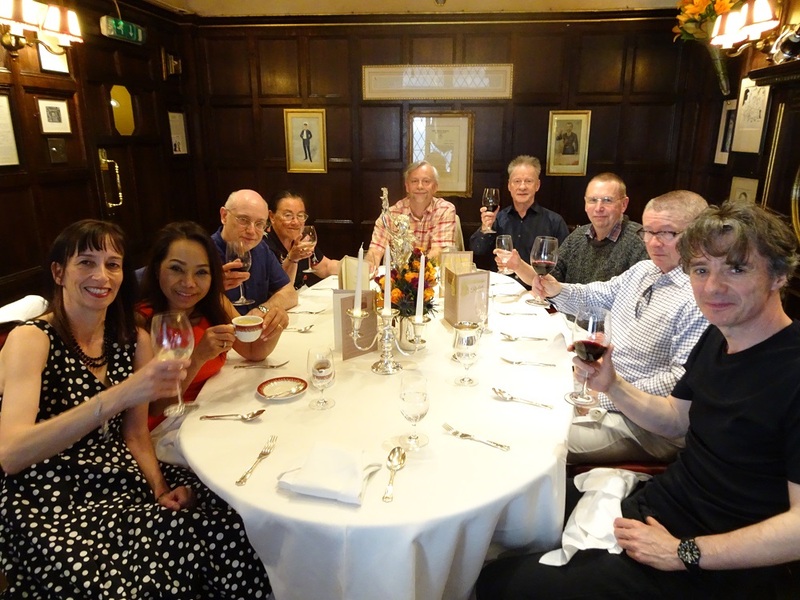 Here, attended by our own private waiter, we were served a sumptuous three course lunch with carefully chosen wines. Like everything else on the tour, the restaurant was chosen for its DW connections. In the War, DW had lunched there frequently and well, because most of the fare they served was not restricted by ration books. Here DW entertained, and was entertained by, the great and the good, and it was here that he would frequently promote the cause of ‘deception’ to his guests. As he confessed in his memoirs, there was often quite a lot to drink, and sometimes he would return to the Cabinet Offices a little tipsy, and he used then ‘to go into either Atlee’s or Beaverbrook’s bedroom to lie on the bed for an hour and sleep it off’, having first arranged to be woken up if he was urgently needed. We wondered if the rightful inhabitant of either of the rooms ever walked in on him ! Lest you think that the lunchtime conversation was narrow, let me hasten to assure you that it wasn’t. Away from the usual DW fare, I remember one in-house expert discussed how he had analysed (ocean) waves using radar waves reflected off the ionosphere, while another talked knowledgeably about the collection of shrunken heads in Oxford’s Pitt Rivers Museum. Even the Duke de Richleau might have found this company impressive ! 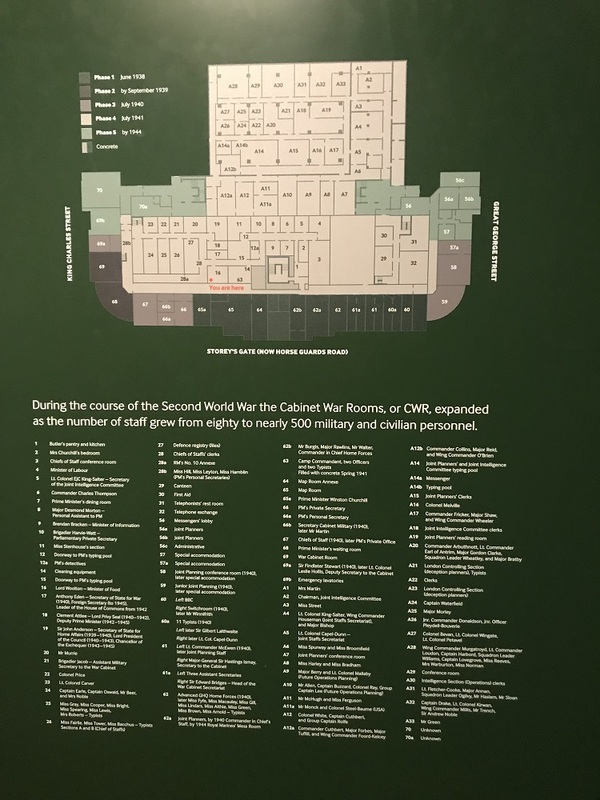 From Rules, some of us had thought that we might make the fifteen minute walk to Clive Steps at King Charles Street near Parliament Square, and to the Imperial War Museum’s Churchill War Rooms. We decided reluctantly after our wonderful but heavy meal that this would not be a sensible option, and we were therefore all deposited there by our excellent minicab driver. Because we had made a ‘group booking’, we did not have to wait with the Bank Holiday queues, and nor did we go in through the normal entrance. Rather excitingly, we were escorted through a normally locked railed-off entrance to the side, down some damp iron steps, and into a vestibule where we were shown an introductory video. Those of us who had seen the recent film ‘Darkest Hour’, with the magnificent Gary Oldman in the lead, were very glad that we had seen it. It set the scene beautifully. 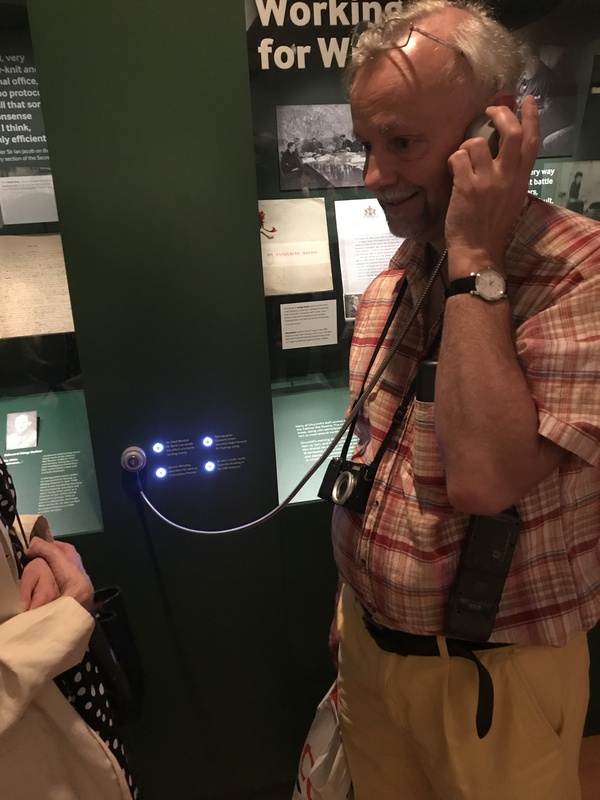 We then joined the ‘normal’ visitors, armed with the obligatory audio guides, although I suspect that several of our group may have known some parts rather better than those who had recorded some of the commentaries. As we wandered round – and we took something like two hours, and could easily have taken longer – we were delighted to see a number of references to DW. More in fact than some of us remembered from previous visits. 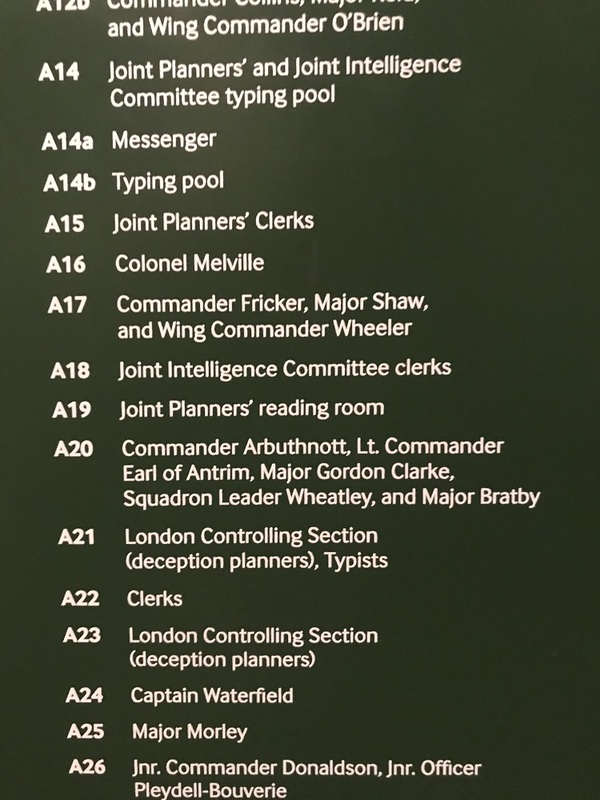 In the vestibule to the Churchill Museum there was a floorplan showing who was originally located in the various rooms, and included in the list was Wing Commander Dennis Wheatley. 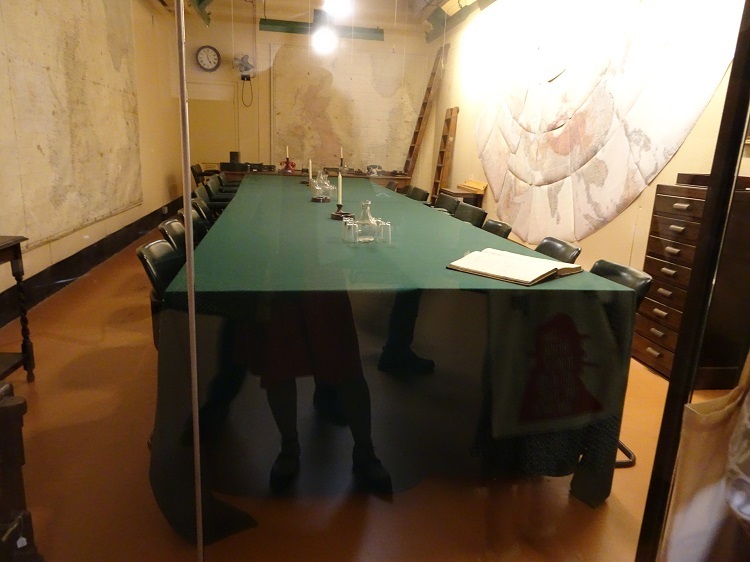 The rooms the London Controlling Section occupied are no longer intact, but you walk where they were when you look at the exhibits in the Churchill Museum. 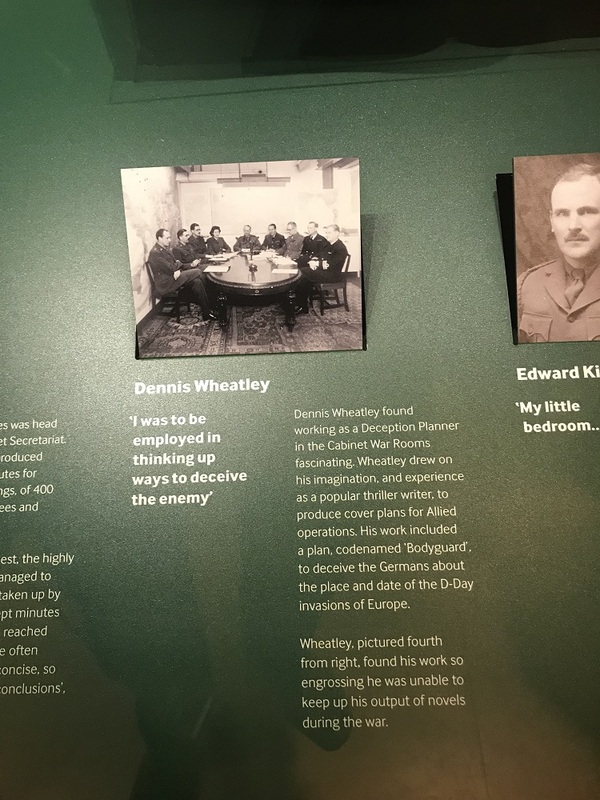 On the left hand side of the corridor leading up to the Churchill Museum there are a number of permanent displays, one displaying some brief remarks about the work of the Deception Planners by a certain Dennis Wheatley. Next to this is an earpiece through which you can hear DW talking in an interview about how he was responsible for the removal of road signs and of names from railway stations so as to confuse enemy parachutists. Moving out of the Churchill Museum, we then wandered down the corridors that are open, seeing the Chiefs of Staff’s Conference Room (DW used to look at the hat stand to see which of the ultra-top brass was in), the Cabinet Room (from which DW ‘souvenired’ a couple of chromium crested ashtrays after one of the midnight meetings of the War Cabinet -for the complete story of this typically DW escapade, see the site’s ‘virtual Museum’, Room 8), and the Map Room among other areas. 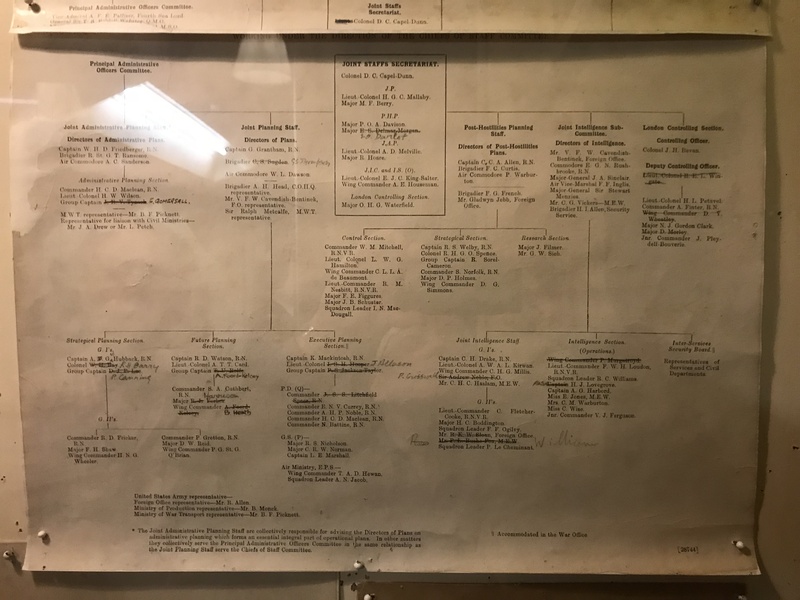 We were again pleased to see DW’s name on a contemporary organisational chart on the rear wall, and outside the room is a print of Sir Winston Churchill. After the war ended, DW bought a copy of this print, and wrote to Sir WC asking if he would kindly autograph it. He did. (I only learned of this charming story a few months ago, courtesy of the excellent Ian Sayer). 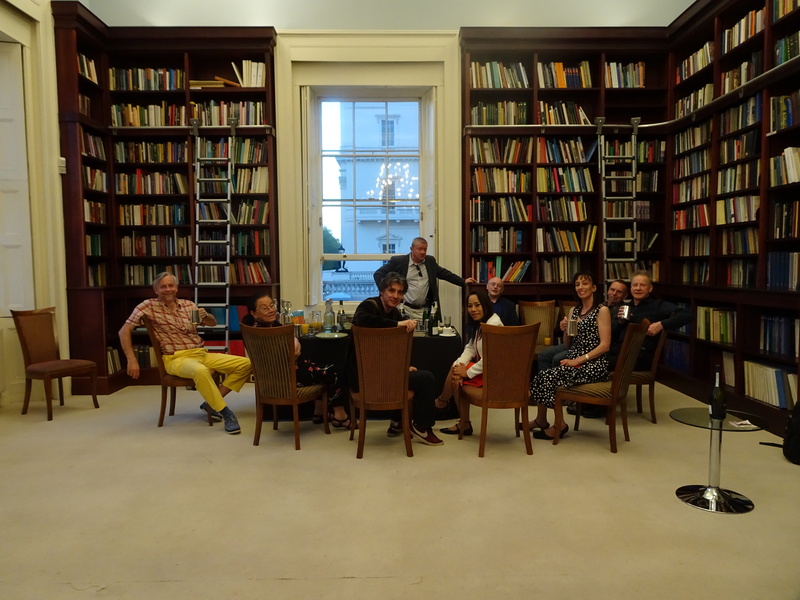 Back in the Bank Holiday sunshine, the minibus collected us and took us to our final venue – Number 10 Carlton House Terrace. 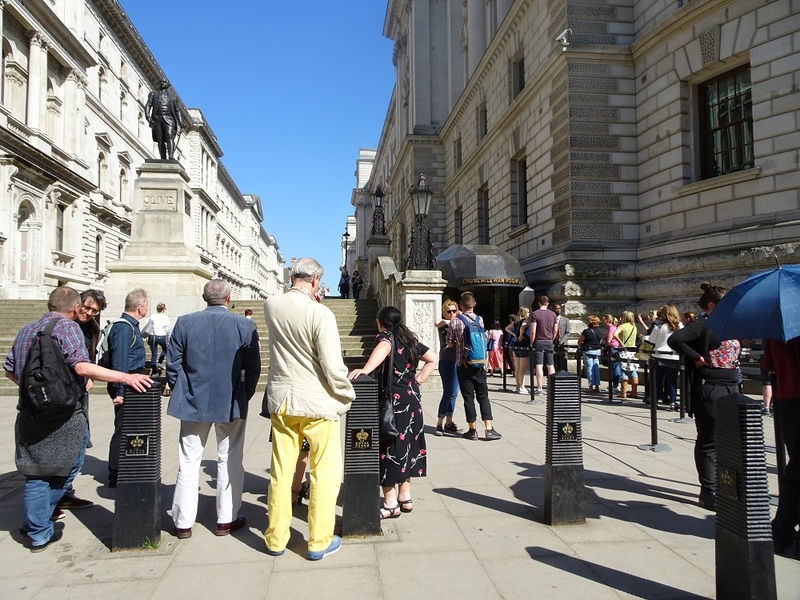 But en route we had another treat (if that is the right word) – the sight of the Foreign Secretary, Boris Johnson, descending the steps of one of the buildings in Pall Mall. 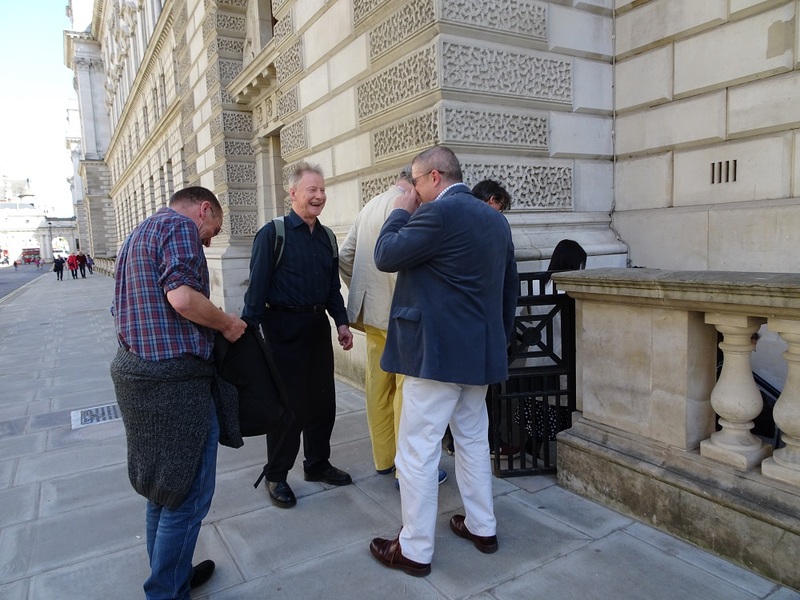 I cannot remember which of our group was so eagle-eyed as to spot him, and again I cannot be sure, but he may have been coming out of the Reform Club. If he happens to read this review (unlikely perhaps ?) he can correct me if necessary. Ten to Eleven Carlton House is the home of the British Academy, and, built in 1831 to designs by John Nash, it was once the residence of Victorian Prime Minister Gladstone. Ten to Eleven Carlton House Terrace is the westernmost building of the eastern terrace (numbers 10-18). The other, western terrace (with numbers 1-9), is separated from it by the Duke of York’s Steps, at the top of which stands the Duke of York’s Column. 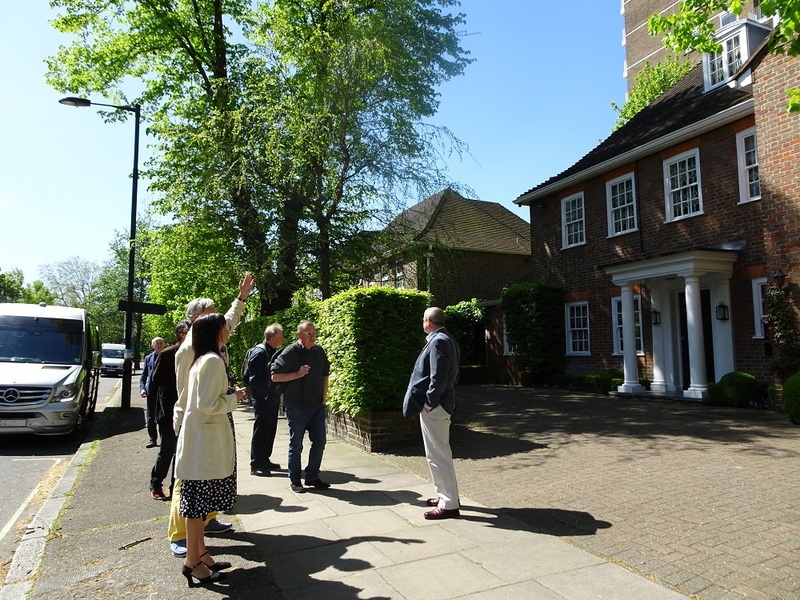 As those who know him can testify, Phil Baker is a treasure trove of bizarre information, and he took several of the party to see the tombstone of ‘Giro’, the favourite terrier of a German Ambassador, which can be seen outside Number 9, which was once the Prussian Embassy. 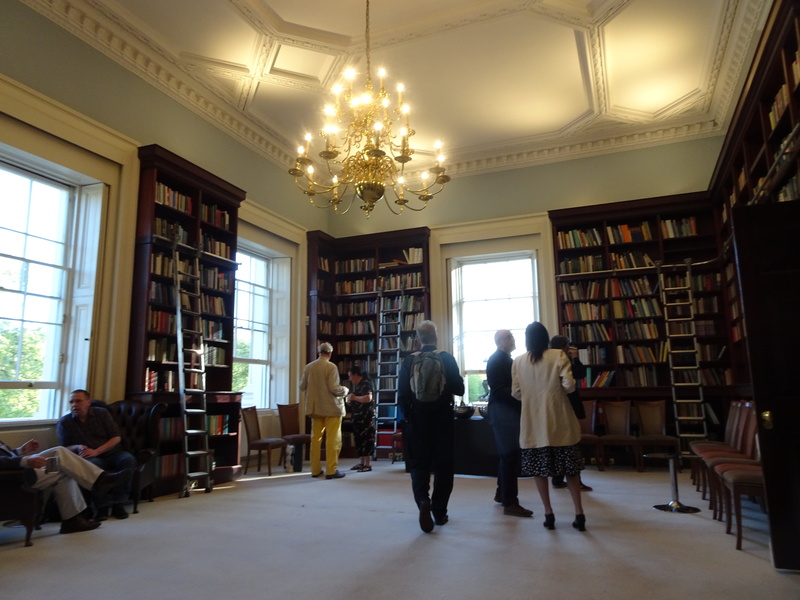 Six to Nine Carlton House Terrace is now the home of the Royal Society, probably the most elite learned society in the Kingdom. 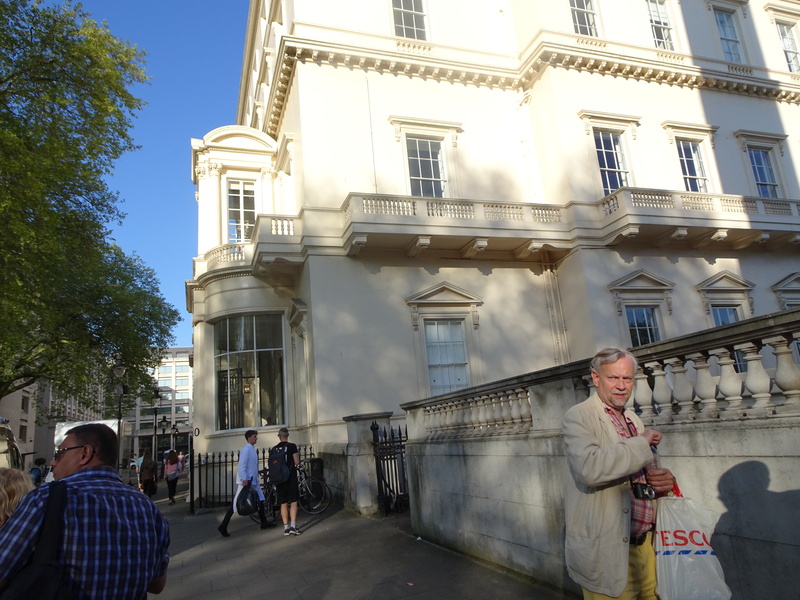 It is well worth a look at the Wikipedia entry on Carlton House Terrace to see the other (mostly eminent) occupants of these wonderful buildings. Why were we there ? The answer is simple. Ninety Four Carlton House Terrace was the home of DW’s wonderful fictional hero Sir Pellinore Gwaine-Cust, the man who sent Gregory Sallust on all his important missions, and apparently ‘had no brains … but an eye for a horse or a pretty woman, and an infinite capacity for vintage port’. Number Ninety four does not exist, but the ever resourceful Franklin had found for us the next best thing. While we couldn’t sip vintage Pol Roger from silver tankards in Sir Pellinore’s first floor library ‘with its tall windows overlooking the lovely vista of St. James’s Park’, we could sip vintage Pol Roger from silver tankards in the first floor library of Number Ten Carlton House Terrace, with its tall windows overlooking the lovely vista of St. James’s Park. And we did. On that wonderful summer’s evening, the nine of us (well one drank orange juice) drank our way through significant amounts of vintage champagne, and nibbled countless handmade canapes (rare roast beef with fondant potato and mushroom ketchup; chicken with lime, coriander, coconut and chilli salsa; smoked salmon roulade with fresh horseradish and lemon meringue tart, to name but four), while discussing everything under the sun about Dennis Wheatley and indeed much else. When the time came (around 9 p.m., I think) for the party to break up, we all agreed we had had a fabulous time. Of course we owe it all to Dennis Wheatley, and also to those who participated, to those at the venues who made it all so memorable, and also and most especially to the ever inventive and ever generous Franklin. 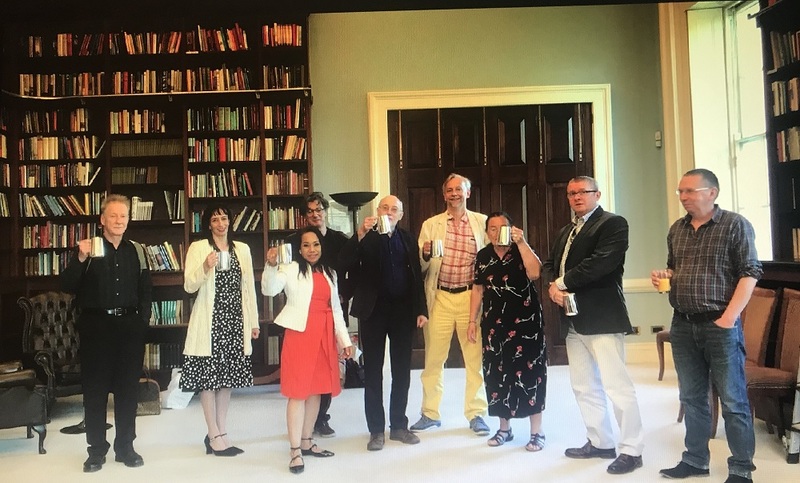 It was a shame that the person who originally mooted the tour was unable to join us, and that several of our ‘regulars’ for such events were also unable to join in. But we drank to all their healths at the end of the evening, and there is always next time. Who knows … it might be even more spectacular ... but that would take some doing !